A few months ago, Alex and I had a disagreement. He asked what baby pigeons eat and I told him they eat bugs and such. He disagreed and told me they eat milk as babies. I calmly explained that, no- birds are not mammals and only mammals produce milk for their young. He said he’d seen on a nature show that baby pigeons eat milk. I explained that he’d misunderstood- birds are not mammals and only mammals make milk. He insisted that baby pigeons eat milk. So, I said that he misunderstood and just let it go without further exploring the idea since I knew I was right (bad homeschool mommy!). Even though he was willing to drop it, I knew he still believed that pigeons make and drink milk. Alex was right. Pigeons make and eat milk. And it got me thinking… the teacher above (if this isn’t just a mock-up to make a point) wants the student to be quiet and allow erroneous teaching, likely so the class can run smoothly. But the little boy refuses to allow an incorrect teaching to stand. He won’t allow the falsehood (intentional or mistaken) be left alone. I can imagine that the teacher felt the boy was being disrespectful, questioning his reasoning, his ability to think, his authority over the class even. In some ways, I guess it would be easy to have a pliable kid- really, Alex is generally pretty easy-going. 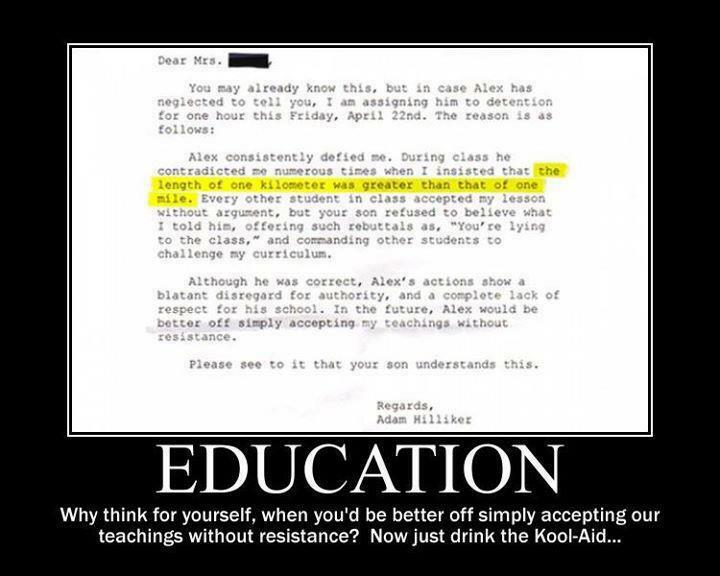 But when I read the letter in the picture above and I remember that my son was willing to stand up for what he knew was right, it makes me feel good. I want my son to question. I want him to think independently and to take the sum of his knowledge and experience and to stand firm when he knows he’s right. There’s never a need for genuine disrespect (which I believe the teacher above is showing to his students)- disrespect is a failure to appreciate the imprint of God in others and to treat them without regard for that imprint. Questioning is not disrespect. The flip side of that coin is humility. Alex needs to allow others to find their own path to Truth- he can’t spoon feed it (like pigeon milk) to others. Sometimes they have to find things out for themselves- like his mama did when I saw the nature program myself a few weeks later. Humility also demands that we question ourselves and our own understandings and beliefs when others challenge us. Instead of stubbornly sticking a point, humility allows us to ask the question again- even if our original answer is confirmed. I hope that my son is gleaning from Brian and I the ability to stand firm, to allows others room for their own exploration and the ability to graciously accept correction when we are wrong. I hope these are the kinds of lessons that my kids are getting from us- their imperfect teachers and parents. But I am really proud that Alex stood his ground. And pigeons make milk- who knew!?! I have to say that, before encountering Dear Charlotte, I wasn’t much of a nature lover… Or, let me restate that- I have always felt an affinity for the outdoors. I remember as a small child curling up under a honeysuckle bush in my front yard for playtime. My sister and I packed the earth down so hard under that bush, it shone like linoleum. We’d take toys under the bush and would spend hours making mud pies and stealing the neighbors daffodils to decorate them (the neighbors were not charmed). It was during this outdoor play that I once dared my sister to bite a worm- she did (the power of an older sister!). I remember taking long walks around the “Yellow Brick Road” (what we called my street as it had inexplicable yellow paint-spray marks all over when we first moved in). It was shaped like a ‘P’ and had only one entrance/exit. For many years, there were only about 10 houses on the street- much of it had been left wild and there was still a swamp around the circle from us. My grandfather took us to the swamp and we saw wild turkeys, turtles, snakes, minnows and many plants with berries, pickers, & leaves shaped like elephant ears. This ‘wild land’ was the playground for my family. The trees hung with vines and we literally swung from them for fun. My uncles created a dirt bike track on some of the unused land. My grandfather went fishing in the stream near the swamp. Deer were a common sight and we would often walk into the woods directly onto the lands and trails of the wildlife preserve that abutted the neighborhood property (in truth, this was the Audubon Wildlife Sanctuary named for its most famous resident, John James Audubon). I remember the land remaining this way until I was 12 years old when the developer decided to put in new homes. Our playground became a neighbor’s back yard and within a year, all ‘our’ land was gone… But, to a burgeoning adolescent, it didn’t seem to matter all that much. 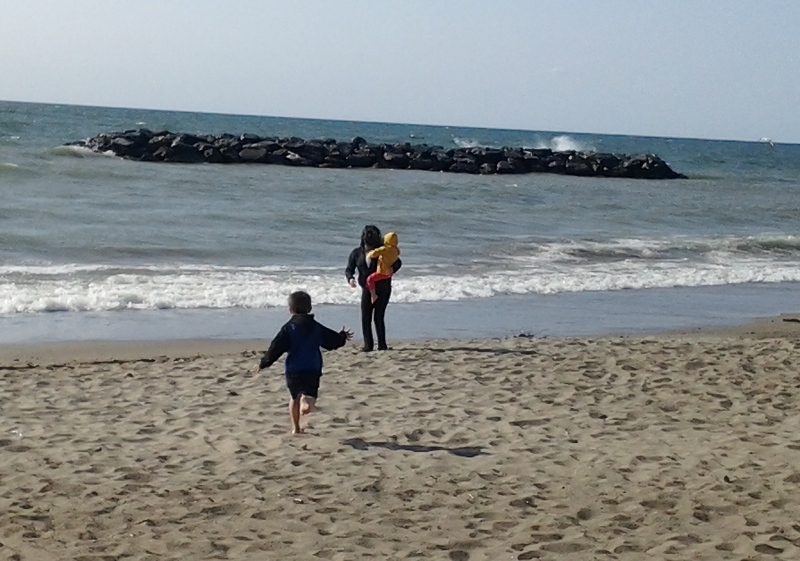 I retreated indoors and stayed there until my son was about 2 years old. Now, I live in an increasingly suburban area. When I was a child, there was a lot of land that remained either farms or simply undeveloped. But when I was about 12 a new highway opened and all along that corridor, housing developments sprung up like cancers, eating away all the natural space. Now, my county has ‘open space’ preserves to keep some areas undeveloped, but much of the country is now cluttered with cookie-cutter houses and suburban sprawl. Add to that, the fact that we have no private outdoor space to allow the children to wander and explore, no safe zone where little children of 5 and 2 can be set free to meander and explore at will, no place to build forts or plant gardens and… well… our situation needs mending. Until the move is possible, we are making do as best we can by studying nature at farms, the less manicured trails and by visiting what nature centers/zoos we can locally. This is made difficult by having only one vehicle, but we are getting by. Today, for example, as our van was in the shop, we brought nature study into our home by continuing our apple study out of Anna Comstock’s ‘A Handbook of Nature Study’. 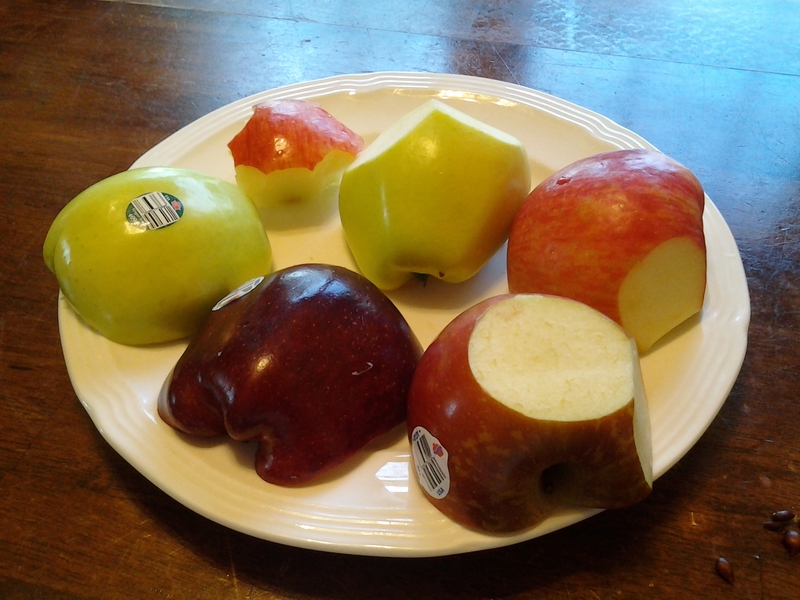 Forgot to take a picture of our apples before slicing for the taste test! My husband selected 4 different varieties of apples; Red Delicious, Ginger Gold, Fuji and Honeycrisp. I followed the directions in HNS and had the kids look at the apples side by side. My son described their skins and I pointed out some color variations on each of their peels. We noted much about the general shape of each apple and then took small pieces to sample. It was so wonderful to be able to clearly note extremely distinctive flavors between apples! Alex was amazed! We gave each apple a new name based on its flavor composition. 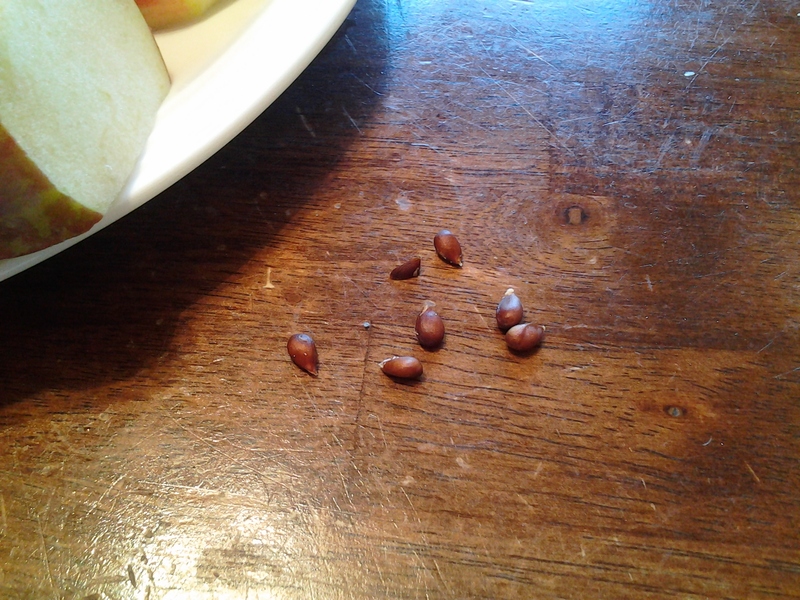 These seeds were thrown off the porch in hopes of an apple tree next year! We then cut each apple open and observed how the seeds in apples sit in little cavities (I described them as each having their own bedroom in their little apple home) and we then noted that the seeds- regardless of variety- were of similar color and size. 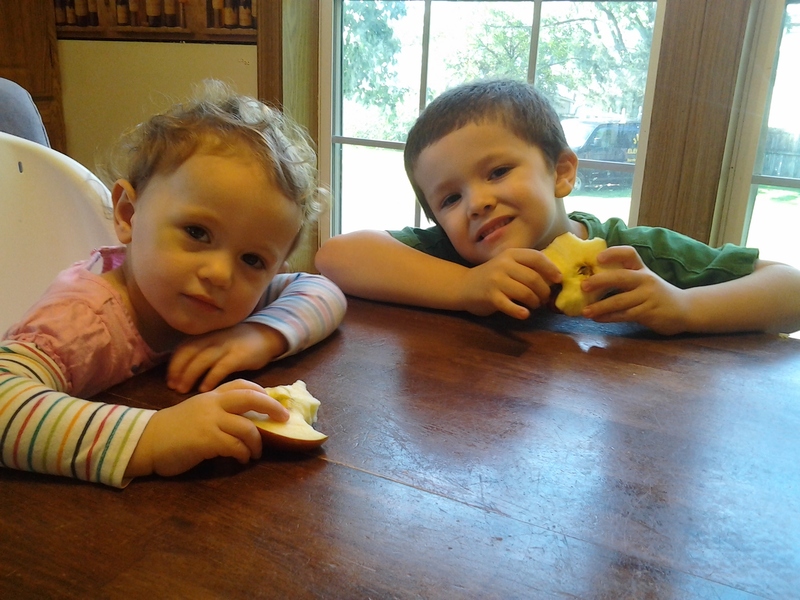 The kiddos munching apples. Fae had the Fuji and Alex wanted the Red Delicious. My favorite was the Honeycrisp! Finally, Alex journaled his observations for the morning. It was a really nice time together- fun, educational and experiential. 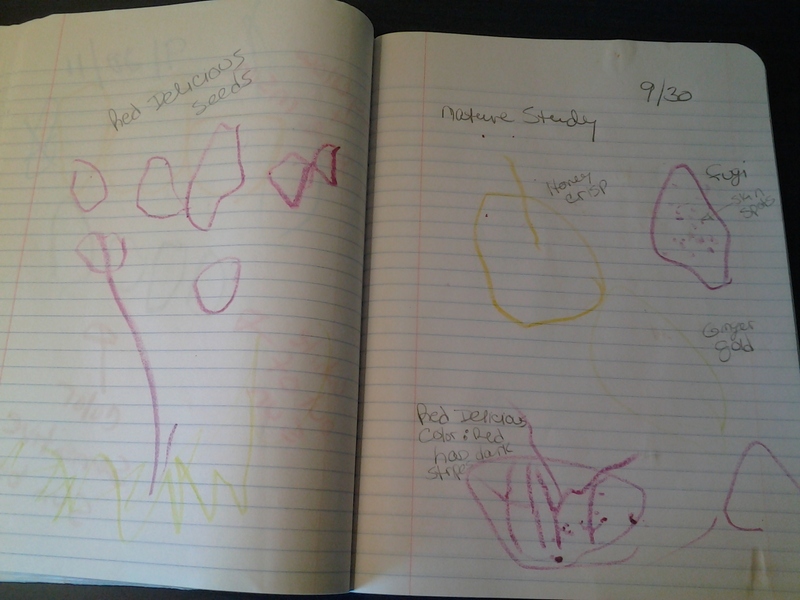 Alex's nature journal. I was impressed with how he noted the subtle color variations on some of the apples. Until we can get into a home that will allow us more space to roam and be without the input of joggers, hikers, dog-walkers, etc., we’ll have to do the best we can to get outdoors and explore- even if that means coming inside!